You can manage your entire life on your phone from anywhere in the world. Cars are getting faster while using less fuel, and robots are becoming less science fiction and more reality with each passing day. Suffice it to say, the methods used to straighten your teeth have been advancing rapidly as well, giving the world Invisalign. You want to get your teeth straightened and you’ve heard of Invisalign, but you still have questions. How does it work? How long does it take? Why would you choose it instead of braces? Today, Dr. James Edmondson of Fossum Family Dental is going to answer 5 of the most common questions about Invisalign in Temple. 1. How Does Invisalign Work? 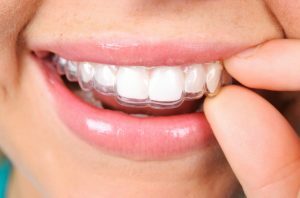 As opposed to traditional bracket and wire braces, Invisalign uses clear plastic aligner trays to gradually straighten your teeth. They are worn over the teeth similar to a mouthguard, though they are much lighter. The trays are designed to be worn in a series, slightly shifting your teeth with each one. They are made from an impression of your teeth and are created specially to fit you. You would wear each tray for 22 hours a day for 2 weeks before moving onto the next one. After you have worn them all, your smile should be completely straight. 2. How Are They Different From Braces? Beyond the material used to make them, Invisalign has the advantage of being both clear and removable. The plastic is nearly invisible to the naked eye while worn, which will help preserve your natural appearance during treatment. You can also take the trays out whenever you need to eat or brush your teeth, which makes them work seamlessly with your life day to day. 3. How Long Will It Take To Straighten My Teeth? Depending on the severity of your misalignment, Invisalign can take anywhere from 8-18 months to completely straighten your smile (which is actually much shorter than the time metal braces usually take). 4. How Does Invisalign Feel? The smooth plastic makes Invisalign very comfortable to wear. Metal braces can be very irritating to the soft tissue of the cheeks and lips, but they will be completely unbothered by Invisalign. Most people forget they are wearing the trays after a day or two. 5. How Will Invisalign Affect My Life? This is really the question most people want answered, even if they don’t know how to phrase it. Invisalign will be able to help you in two big ways. The most obvious is that your teeth will be straighter, which will actually make them much easier to clean, and therefore healthier. The second way goes much deeper. Both during and after treatment, you’ll gain a confidence in your smile that you haven’t had before. This will make life open up to you, as talking and laughing will suddenly seem so much easier because you finally don’t have to worry about people noticing your crooked teeth. All in all, Invisalign is a complete type of treatment that helps people way beyond their teeth. You can get the smile you’ve always wanted without the look or discomfort of braces thanks to Invisalign. If you are interested in getting your teeth straightened quickly, easily, and effectively, make an appointment with your dentist in Temple today.